When, if ever, should the nation prioritize balancing the federal budget? Government spending must stop growing. The government, like every Hoosier [Indiana] household, must be required to balance its checkbook and stop living on a credit card. National income will be greater tomorrow than it is today because Government has had the courage to borrow idle capital and put it and idle labor to work. . . . Our national debt after all is an internal debt owed not only by the Nation but to the Nation. If our children have to pay interest on it they will pay that interest to themselves. A reasonable internal debt will not impoverish our children or put the Nation into bankruptcy. On September 4, 2011, the Gainesville, Florida, Tea Party launched an Internet meme by claiming to simplify the Congressional debate over raising the debt ceiling. They claimed that simply removing 8 zeroes from the federal government’s expenditures, revenues, deficit, outstanding debt, and proposed budget cuts would facilitate easy comparison to a household budget, and reveal a shocking lack of discipline and foresight on the part of policymakers (Newsom, 2011). How valid is this comparison? On the one hand, a comparison between the management of a household budget and management of the federal budget is tempting. It is a rhetorical device that pundits and politicians use when they are advocating fiscal restraint because it is a frame of reference voters will understand. On the other hand, the analogy breaks down in at least one important way. Whereas households must borrow money from unforgiving, outside sources (banks, for example), the government has more flexibility because much of what it borrows, it borrows from itself. In fact, economists argue that some level of debt can be good for the economy, particularly if the money borrowed finances investments in future productivity. Traditional economists believe the government should not play a role in stimulating the economy, but those who accept the theories of economist John Maynard Keynes believe that using borrowed money for short-term deficit spending can help to stimulate the economy when it is not doing well. This proposition introduces several other important questions: Which investments ensure future economic growth? (In household terms: Would borrowing to go on an expensive vacation have the same effect on future income as borrowing to go to college?) What is the distinction between the short term and long term? Is there a limit to how much debt the government should have, and are we approaching it? If so, what are the consequences of too much debt in the long term? Get the answers right, and a targeted economic stimulus will help the economy recover and bolster the long-term outlook. Get it wrong, and one of two things could happen: On the one hand, balancing the budget too soon in an austerity approach could cripple an economic recovery; on the other hand, failing to plan for the long term and borrowing too much to fund wasteful and inefficient projects could send interest rates and inflation skyrocketing. This, in turn, would curb investment, hurt consumer confidence, and reduce prospects for future economic growth. The key takeaway? It’s not simple. Balancing the budget is not inherently “good,” and debt and deficits are not inherently “bad” (nor is the reverse true). In summary, the value of balancing the budget versus running deficits and incurring debt for the short or long term depends on (1) the type or purpose of the debt, (2) the time frame of the proposed borrowing, and (3) the total size of the debt. In this lesson, students will wrestle with this complex challenge by using evidence and adopting a range of perspectives. In this 2-day lesson, students will not be expected to reach a definitive conclusion on how to weigh the competing imperatives of managing the budget. They will, however, use the tools of economics to propose criteria for evaluating when debt is “good” in the short term and long term. Just as importantly, they will develop questions that will take them to a deeper understanding of these complex issues. Note: This lesson is rich in content. Students with a background in the topic will have success with a 2-day experience because some portions (for example, the mini-lesson) can be abbreviated or omitted. For students new to the topic, 3 to 4 days will make the experience more rewarding. Budgeting requires weighing substantial trade-offs among the benefits of government spending, the costs of taxation and debt, and the opportunity cost of pursuing some programs at the expense of others. Decisions about budgets require weighing these trade-offs in light of our national values and priorities, but they must also be informed by an economic analysis of their costs and benefits. Costs and benefits of debt can vary based on the time frame of the analysis and the reasons for incurring the debt. Analyze graphs, tables, and charts. What in the cartoon are you familiar with or have you seen before? In what context? What terms, images, or connections in the cartoon are new to you or are used in an unfamiliar context? budget crunchOnline Extension: Students may use CEE's budget crunch to comment upon the cartoon. Encourage students to add a caption, thought and/or speech bubbles, and clip art stickers to reinforce the meaning of the cartoon. As an added challenge, have students use these tools to alter the meaning of the cartoon, presenting a perspective that differs from that of the cartoonist. What is the likely cause of the “budget crunch”? What are the possible costs or consequences of the budget crunch? What point of view does the cartoonist have on the need to reduce deficit spending? Present a brief mini-lesson to introduce or review the basic concepts and vocabulary of the federal budget. The concepts introduced here are developed in much further detail in the other economics and civics lessons in this curriculum. Online Extension: What are the tradeoffs that policymakers face when steering the federal budget? 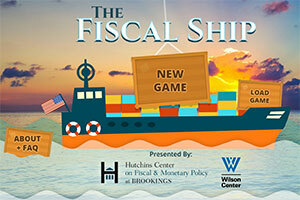 To answer this question, students will grapple with the complexity of federal budget choices as they play The Fiscal Ship , a game created by the Hutchins Center on Fiscal & Monetary Policy at the Brookings Institution and the Serious Games Initiative at the Woodrow Wilson Center . Students will set policy goals and strive to make budgeting decisions that both advance those goals and reduce the federal debt, weighing conflicting advice from opposing perspectives on the possible impact of their choices. The amount of money the government takes in each year (largely through individual or corporate taxation) is known as revenue. The amount it spends is known as expenditures. When revenue equals expenditures, the budget is balanced. If the government takes in more money than it spends, it has a surplus. If it spends more money than it takes in, it must borrow to make up the difference. That difference is known as the deficit. The accumulated deficit over many years is known as the debt. One measure of the health of the economy is the debt-to-GDP ratio. The gross domestic product (GDP) is a measure of total production in the economy in a year. The theory behind using the ratio is that, as the economy grows, the government’s ability to pay back its debt improves, so any absolute level of debt becomes less significant. The federal government cannot raise unlimited amounts of money because taxation itself has direct and indirect costs and consequences. This limit on resources is called scarcity because the federal government, like any other budgetary unit (an individual, a family, a company), has an unlimited number of ways in which it might use its limited resources. Scarcity means that balancing the budget requires making choices, and choices always involve trade-offs. The same money can’t be spent twice. A choice has two costs—the direct cost of the choice and the “cost” of giving up something. The cost of giving up something is called an opportunity cost—the cost of a missed chance to get the second-best alternative, the second choice. Some federal programs have long-term legal or contractual obligations, and thus are difficult or impossible to cut in the short term. Spending money on these programs is not a choice. These are known as mandatory programs, and include Social Security and Medicare. Required spending on mandatory programs limits how much money Congress can choose to allocate to discretionary programs, for which Congress does have funding power. Revenue, whether raised through taxation or borrowing, is limited, so Congress and the President must make difficult and interdependent decisions when they build the federal budget. Choosing to spend money on one program means there is less opportunity to spend money on another program. Congress and the President must decide (1) which programs to fund and at what level, (2) whether to raise or lower taxes, and (3) whether to borrow money instead of (or, in addition to) raising taxes. These choices all have economic consequences. Those consequences are the focus of this lesson. Distribute Resource 2, Background on the Debt. Instruct students to read the graphs, first individually and then with a partner. Their aim should be to come to a consensus on the most important points these documents include about the debt and determine what additional questions these facts raise. What are some of the main features of the debt of the U.S. government? What is the reaction of students to these numbers? What questions do they have as a result of considering them? What would be some of the potential benefits of balancing the budget? Conversely, what are some of the costs of not balancing the budget? How has the debt changed over time? What might have driven these changes? Given these numbers, students may become alarmed and may be quite inclined to support a balanced budget, or even a budget with large surpluses to reduce the debt. Remind students that, based on the Entry activity, balancing the budget or raising a surplus will have costs as well. Ask students to think about the circumstances (if any) under which the budget should be balanced, and when, if ever, some debt might be good. Determining when the government should prioritize balancing the budget, given the costs and benefits of doing so compared to alternatives, and when, if ever, the government should take on more debt is the focus of the remainder of the lesson. Distribute Resource 3, Balancing the Budget in the Short Term. Tell students they will be analyzing a cartoon and reading examples of deficit spending descriptions and of purposeful deficit spending. Using the same approach they used for the “Budget Crunch” cartoon (i.e., beginning with familiar points of reference), ask students to look at the cartoon, “Debt and Unemployment.” Propose to students that “debt” represents long-term economic problems and “unemployment” represents short-term economic problems. Students should then develop their own interpretation of what the cartoon says about the trade-off between long- and short-term economic problems. Take the students beyond the information explicitly included in the cartoon, and lead a discussion in which they share their views on what the cartoon means, the trade-off it points to (paying down the debt at the cost of increasing unemployment), and their own initial thoughts on that trade-off. Students should then read the description of fiscal stimulus, which offers a very brief overview of one of the basic ideas of John Maynard Keynes; namely, that in times of short-term recession in which the economy is operating below its long-term equilibrium level of employment, the government can stimulate the economy by increasing spending and lowering taxes, even though that inevitably increases deficits and debt. This is known as deficit spending or fiscal stimulus, and stands in contrast to policies aimed at reining in debt, or fiscal austerity. Students should discuss with a partner how this relates to the message of the cartoon, and if their perspective on the cartoon has changed. Answer any questions students have on the basics of Keynesian theory to ensure they understand the concept and mechanics of it before moving on. Students should then read through the “Perspectives on Short-Term Stimulus and Borrowing,” first independently and then comparing notes with a partner or group to challenge and question one another. Circulate among the groups of students and probe their observations and inferences based on these perspectives. Prompt them with further questioning to engage them in looking at multiple points of view on the subject of balancing the budget versus borrowing money in the short term: What information can they gather from these excerpts? What types of evidence do the excerpts use? What is the source of this information, and do the students find the source credible? What additional information would be necessary to put this information in context and draw conclusions about the costs and benefits of balancing the budget versus borrowing money in the short term? Lead a class discussion on the findings, pushing students to dig deeper into the evidence. Begin with a review of the costs and benefits of balancing the budget in the short term, using the examples students found for homework as a starting point. Inform students that, although economists and policymakers disagree about the relative merits of balancing the budget compared to fiscal stimulus in the short term, the debate changes somewhat regarding long-term budget shortfalls (deficits). (“Long term” is defined by more than years. Because the economy takes time to adjust to new conditions, and some things are more flexible than others [like the price of candy—flexible—versus salaries, or the number of factories in a country—not so flexible], economists specify that a defining measure of long term be the period of time over which all prices have had time to adjust to changing conditions, and over which new capital goods, such as factories, can be built.) Policymakers give importance to the distinction between long- and short-term budget shortfalls because deficit spending and debt that is justified in the short term to address a recession may have different consequences, some good and some bad, over the long term. For example, some types of debt represent an investment in long-term economic growth and therefore “pay for themselves.” Debt accrued to build a mass transit system might be an example of this. On the other hand, in the long run, very large debt can be unsustainable and weigh down the economy. Distinguishing between the short term and the long term, and between debt that weighs down the economy by increasing interest rates and discouraging private investment and debt that funds public investments that help the economy grow, is the challenge of the second day of this lesson. Distribute the political cartoon in Resource 4, Balancing the Budget in the Long Term. Beginning with an analysis of the cartoon, students should use Resource 4 to understand the various points of view presented on the costs and benefits of balancing the budget and incurring debt in the long term. What does the cartoon suggest about the connection between debt and growth? Distribute the three brief readings, Perspectives 1–3, also in Resource 4. Ask students to analyze the three points of view on balancing the budget in the long term that they represent. Students should identify the position each writer takes and the evidence the writer uses to support that position. Students should decide whether they find that evidence credible, what additional questions they would ask, and what further information they would seek to further confirm or disconfirm the validity of each author’s conclusions. The authors agree that under some circumstances debt in the long term may be good. What are those circumstances? What are some of the concerns raised about long-term debt? What evidence do the authors cite to support their claims? Is this evidence credible? What additional questions do you have or information and evidence would you seek to more fully evaluate these positions? Using this information, as well as their own values and priorities, students will envision themselves as economic experts who write editorials and appear on television news broadcasts offering commentary and analysis on the news of the day. They will need to use a consistent set of economic criteria in order to judge the adequacy of a budget proposal. The proposal might be based on balancing the budget, or it might build in deficit spending that will stimulate the economy. Students should use the concepts learned in this lesson and the graphic organizer in Resource 5 to decide on the criteria they will use for evaluating the proposal. The organizer models this process using the criterion “debt is at a sustainable level.” This sample entry can be distributed to students or retained as a teacher resource. Within each criterion, students will create a set of questions. The answers to these questions will tell them whether the proposed budget meets their criteria for a good budget. Of course, they will also have to decide on the kind of evidence they consider solid. To help students get started, give them two examples of the types of proposals they would be considering with their criteria, one short-term and one long-term. Remind them that they do not need to actually evaluate these proposals at this point; instead, the aim is to give them a tool they can use to evaluate any budget proposal as they become voters and engaged citizens. Short-term example: Raising concerns about stagnant wages and potential weakness in the global economy due to declining energy prices, a group of representatives in Congress has proposed a stimulus package to increase wages and stave off unemployment and a potential recession. The package would consist of $100 billion in increased assistance to needy families; $100 billion in subsidies for job retraining for those who have been out of work and looking for a job for more than 6 months; $100 billion to help state and local governments hire more police officers, firefighters, and teachers; and $100 billion for major transportation and other public works projects. The proposal calls for these programs to be paid for with additional borrowing, rather than tax increases, because lawmakers fear that raising taxes will harm economic recovery. Long-term example: Deeply concerned with the effects of excessive public debt on interest rates and private investment, and with the long-term fiscal stability and sustainability of the U.S. government, the president unveils a proposal to automatically trigger aggressive debt reduction whenever the economy is doing well. He defines “doing well” as any time unemployment dips below 6% for 6 straight months. At that point, tax revenues will increase by $500 billion a year by closing loopholes and raising rates. In addition, substantial cuts to discretionary programs and reductions in benefits for mandated programs will result in a $500 billion cut in yearly spending. The increased tax revenues and reduced spending on mandated programs will produce immediate surpluses that can be used to start paying down the debt. Have students compare the criteria, questions, and evidence they developed. For homework, have them write an essay on the essential dilemma of this lesson: When, if ever, should the nation prioritize balancing the federal budget? CCSS.ELA-Literacy.RH.9-10.6. Compare the point of view of two or more authors for how they treat the same or similar topics, including which details they include and emphasize in their respective accounts. D2.Eco.2.9-12. Use marginal benefits and marginal costs to construct an argument for or against an approach or solution to an economic issue. D2.Eco.13.9-12. Explain why advancements in technology and investments in capital goods and human capital increase economic growth and standards of living. This lesson can be extended into an in-class or independent research study of the European sovereign debt crisis of 2009–2012, in which students analyze the causes of the crisis, the relative merits of different proposed responses, the advantages and disadvantages of stimulus versus austerity policies in the short term, and the growth prospects of European countries as they relate to their respective levels of public debt.